Púca worked with ad agency, Bloom, to create an integrated digital campaign for Irish Distillers’ brand, West Coast Cooler. West Coast Cooler is an alcoholic beverage made from white wine and fruit flavourings. It is owned and produced by Pernod Ricard’s Irish subsidiary, Irish Distillers. Púca was contracted by Bloom Marketing on behalf of West Coast Cooler to create a mobile strategy to support a series of pub promotion nights entitled The Thursday Club. The Thursday Club promotion ran in selected venues throughout Ireland and was targeted at a female audience aged 25+ and offered a free West Coast Cooler in venues on certain Thursdays. The nights also featured a free professional mini makeover or manicure and competitions for shopping sprees. In addition a native Android App was provided to each of the bars to enable them redeem all vouchers. Facebook was at the core of the solution Púca developed, with most aspects of the campaign closely tied in with the Facebook API. A single url was promoted which when accessed, would redirect the customer to the most appropriate ‘page’ for whatever device the customer was using. All prospective customers were asked to verify their Age prior to being able to access any of the apps or sites in the campaign. 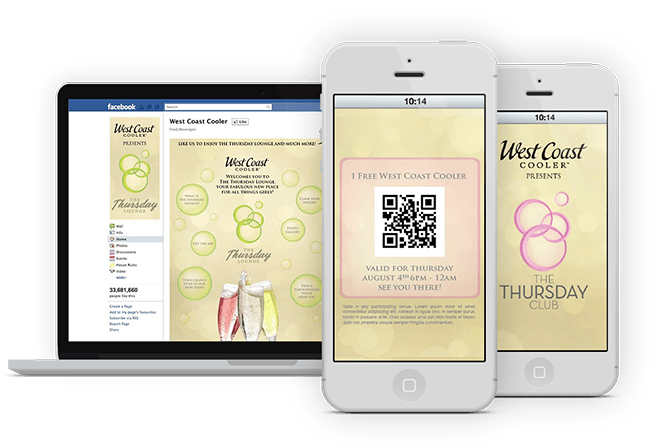 The technical delivery of the promotion was facilitated by Púca’s unique voucher system, SmartKode, which enabled customers to use either their mobile handset or a print-out from Facebook to claim the free West Coast Cooler offer. Each voucher was validated in real-time at the venues using a separate redemption app provided to the bars. By being deeply linked to the Facebook app, and having received all of the user permissions at the point of registration, updates could be posted to the customers’ Facebook accounts when they redeemed their vouchers or checked in to the Venues via the app. This spread knowledge of the Thursday Club promotion virally and exponentially to the customer’s friends. Statistics on all vouchers issued and redeemed were captured in realtime and put into an automated report that was sent to Irish Distillers and to the individual pubs at 1 minute past midnight each Thursday night/Friday morning. The campaign significantly boosted engagement with the West Coast Cooler brand. The solution provided for rich statistical insights on that engagement both by the customers and the bars. Tools used for statistics included Facebook Insights (user profile and usage data), Google Analytics (usage data across all platforms), Appannie (app download statistics) and in addition detailed statistics on vouchers issued and redeemed were provided using the SmartKode system. This was a highly innovative campaign that has provided West Coast Cooler and Irish Distillers Ltd as a whole, a very encouraging and insightful taste as to what the future holds for one-to-one digital and social media marketing.